The courageous cancer survivor now wants to help save other terminal cancer patients with medical cannabis provided by a UK Compassion Club. 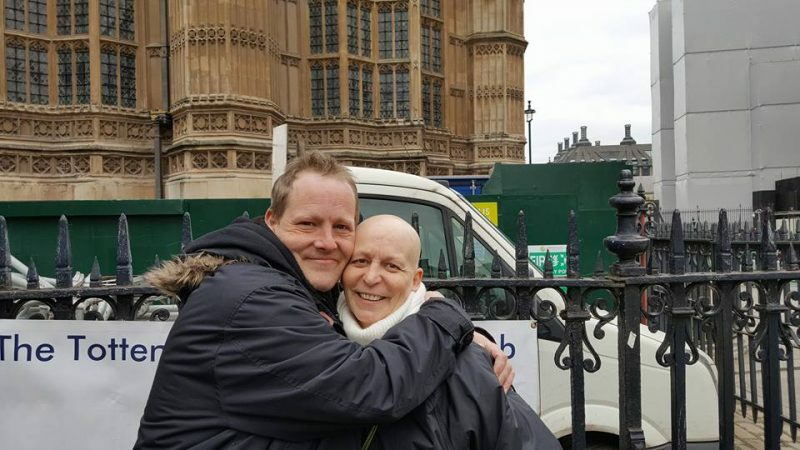 Sharon Fitzsimons, 50, from Glasgow, announced she had won her battle with cancer on Monday, claiming her use of a tincture containing THC and CBD, helped her deal with the pain her chemotherapy was causing. “I went for a routine hysterectomy on the 18th July of last year, because of my family history of cancer. I decided to go for surgery, it all went well. “Two weeks after my first surgery I was told they found cancer in both fallopian tubes and also on the outside of my ovaries, which makes cancer spread. “There was a second surgery to remove Omentum fatty layer which covers the organs. They found cancer in there as well and also in 7 lymph nodes. Sharon during one of her visits to Queen Elizabeth University Hospital. “I did initially take the prescribed medications, but managed to wean myself off them. I never took the morphine, or any of the other opiates. “I just took my 1:1 tincture and it took the pain away! It helped me sleep, helped me eat. Despite the help cannabis provided Sharon, the ancient herbal medication is still demonized in British society due to the decades of Prohibition and propaganda rhetoric, such as the current “Skunk” madness circling British media stories. “I deal with this issue all the time with terminal patients who are afraid to take it, even after I explain all the potential benefits. “The stigma is so bad they probably think I’m mad! “I’m made to feel like a criminal, but I would go to jail in a second rather than die! “I try very hard to get my terminal friends to take it, but the stigma cannabis gets makes me sick. “By the time they make it legal, I will have lost many friends who are truly beautiful people. People, who are in the worst pain imaginable! “Shame on the establishment! They have blood on their hands! “I told every doctor I have had what I use; ‘they say good!’ They were so positive about it. Cannabis clearly has the potential to help so many people who are in life-threatening medical conditions or constant pain. Without it, brave women like Sharon may not be alive. Due to prohibition, patients are at the mercy of the black market, often being over charged or scammed by criminal gangs. The cannabis picked up from street dealers may not be the right strain, with the right cannabinoid ratio, for a patient, and is often over-priced, leaving patients in financial ruin, just for trying to access a medication. Thankfully organizations and clubs are being set up all over the UK to defy the government and bring medical cannabis to those who need it most. “I just wanted something for the pain. I am not, nor was ever, a smoker. Unlike many medical cannabis users in the UK, however, Sharon was able to find a Compassion Club, The Tottenham Compassion Club (TTCC), after speaking to Callie Blackwell, who brought medical cannabis into headlines last year after going on national TV to announce it had helped save her son’s life. “As soon as I had cancer I started looking into Medical Cannabis. “I contacted Callie after seeing her on loose women and she gave me the details for someone from Tottenham Compassion Club (TTCC). “I had messages from many different sources, including a lab in Barcelona, offering me help. “I decided to go with TTCC after a long conversation with one of their members. He advised me to begin a 1:1 tincture in August, last year. “He also gave me cannabis flowers, high in CBD, and that was it! “He is a life saver! My pain just went away, it was truly amazing! While Sharon did use chemotherapy to initially treat her cancer, the brave mother’s story clearly indicates that medical cannabis helped her survive the battle, and will continue to help her deal with the constant pain she is in post-chemo. British laws, which classify cannabis as having “no medicinal value,” are endangering the most vulnerable members of our society. Not only are patients being warned against the “dangers” of cannabis, which is putting many off the non-fatal drug, but it is also forcing them to fund criminal gangs by buying cannabis from the streets. While many Governments across the world, most recently Greece, are legalising cannabis for medicinal purposes, our Conservative Government is refusing to allow patients the same right in the UK. “Cannabis is listed as a Schedule 1 drug, as in its raw form it is not recognised in the UK as having any medicinal benefit and is therefore subject to strict control restrictions. “This means it cannot be practically prescribed, administered, or supplied to the public in the UK, and can only be used for research under a Home Office licence. This is not right. It is a cruel, heartless response to a situation which needs addressing with compassion. The same compassion TTCC showed to Sharon, which she is now passing onto other terminal cancer patients. Without more medical cannabis patients standing up to share their story, the public will never know how ridiculous and vicious our current drug laws are. I think Sharon’s story is amazing, we need Medical Cannabis legalised in UK. I too have Cancer (nsclc) had radiotherapy changed the food I eat, take supplements and a bit exercise also take cannabis now too, but don’t know how much cannabis is in capsules as not controlled.